Born 6 September 1817 in London, England; died 19 September 1893 in Montréal, Que. Galt was a Scottish-Canadian businessman, born in Chelsea, who represented Sherbrooke, Quebec. Galt was a key player in Canadian development through the British American Land Company, and as a director of the Grand Trunk Railway. He was Canada's first post-Confederation Finance Minister, and later in life Canada’s first High Commissioner to London. Galt’s federation resolutions of 1858 are acknowledged as having made federation “practical politics” for the first time. 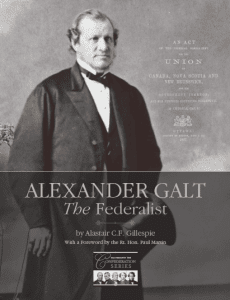 Galt's early federalist speeches were important acts of public advocacy, arguing that a federal union could release the sectional conflicts that plagued the old Union of Upper and Lower Canada. He is credited with promoting the economic case for Confederation and designing its financial terms. In his role as leader of Lower Canada’s English-speaking Protestant minority, Galt worked to secure the rights of his community though a partnership with George-Étienne Cartier. Their partnership is a leading fact of Canadian history – showing that the protection of minority rights was at the heart of the Canadian founding. For more on Galt, see the Dictionary of Canadian Biography. The Macdonald-Laurier Institute is pleased to showcase the third paper of its Confederation Series, written by Munk Senior Fellow Alastair Gillespie.